The mayor announces stricter e-bike enforcement on Thursday. UPPER WEST SIDE — It's pedals or penalties. 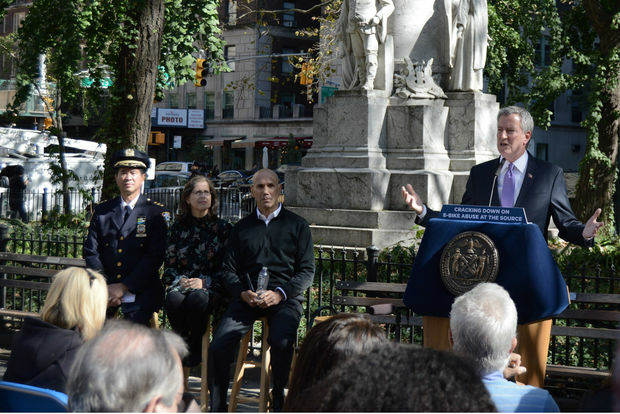 On Thursday, Mayor Bill de Blasio announced that the city would begin cracking down on electric bicycles, or e-bikes, by targeting the businesses that enable their usage. Currently, those operating the bicycles that are equipped with an electric motor are subject to confiscation and fines up to $500. 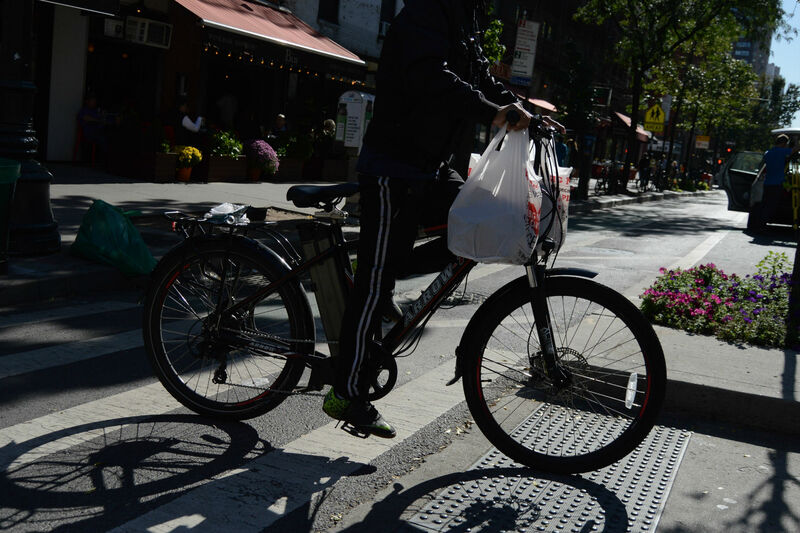 But starting next year, businesses that employ delivery riders with e-bikes will receive a summons and a $100 fine, which will double for each subsequent offense. While electric bikes are legal to own in the city, e-bike users are subject to fines when they're used on city streets. "Crossing the street in New York City should not be a harrowing experience, you shouldn't feel unsafe crossing streets in your own neighborhood," de Blasio said Thursday. "We have to go after anyone that creates a threat to neighborhood residents." A 2012 Department of Transportation estimate put the number of delivery cyclists in the city at 50,000. Many of them are undocumented immigrants who work for minimum wage. The NYPD seized 923 e-bikes so far this year, compared to a similar time frame in 2016 when they only confiscated 341. The department added that nearly 1,800 summonses have been issued to e-bike operators this year. According to the NYPD's motor vehicle crash statistics, there were roughly 7,500 crashes involving cars, SUVs, trucks, vans, and commercial vehicles last month in Manhattan alone; only 193 involved bicycles. When asked about the number of incidents involving e-bikes, the NYPD said they do not track collisions with that level of specificity. The NYPD's Chief of Patrol, Terrence Monahan, said officers who catch e-bike operators will fine them accordingly and then find out where the e-bike came from and prepare a summons to be mailed to the location of the business. Business owners cannot recover their property until all related fines are paid off. Complaints about electric bike usage have increased significantly over the past years, according to area politicians. In Councilwoman Helen Rosenthal's district, e-bikes have been one of the most frequent category of complaints. "More often than not, there are multiple delivery bags hanging from the handlebars," Rosenthal said. "A clear indication that the businesses sending these bikes are encouraging hasty deliveries rather than focusing on safety and consideration for the pedestrians." Ultimately, the mayor said he hopes that the new regulations will persuade business owners to consider going back to regular bicycle or car deliveries. "My hope is this will cause business owners to stop using e-bikes, it’s as simple as that," de Blasio said. "As they see more and more fines, more and more confiscations, it’ll convince the business owners to get out of the e-bike business altogether."